You are here: Home / Social Media / What’s up with Videos on Facebook? The way we interact with content continues to change as technology and social networks evolve. Although each Facebook user experiences the same social network, their experience with content on the platform is tailored to their interactions and interests. Over the past few months many have noticed how prominent video content is in the News Feed. That’s because Facebook’s algorithm is designed to satisfy the end user, and right now the end user is loving video. Due to the recent spike in popularity of Facebook videos in the past year, Facebook continues to increase video support for both viewers and creators. So what does this all mean to page admins? 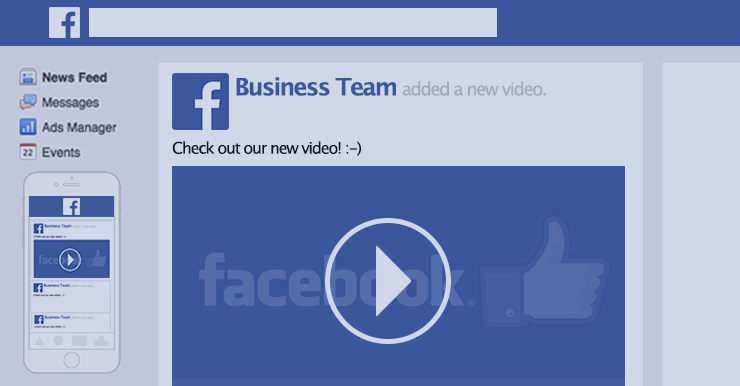 If you haven’t started to upload videos directly to Facebook to share, do it now! Upload videos, share videos, and measure your videos to create future strategy. Recent updates allow page admins to see how many views a video has received in addition to other analytics such as viewership retention. You’ll be able to see if a viewer watched the entire video or ended the view before it was finished. This will help you develop an understanding of what your viewers attention pans are and what they are looking for. Providing competent video playback directly on Facebook also allows viewers to watch your content without being redirected to another source, previously forcing them to leave your page. This will cut down on some of the potential distractions your viewers may have when viewing your video on another platform like YouTube or Vimeo; “Oh look, cats playing piano!” [CLICK]. Obviously, you want to keep your costumers on your page as much as possible. Remember, this is a busy and over saturated platform. Be sure to post quality content that sparks interest to your intended audience that encourages them to come back for more. As always, these platforms update constantly so take advantage of what’s hot today, today, because we may be in a different ball park tomorrow! « Are You Using Emojis to Speak to Millennials Yet?